When setting up a woodworking workshop or are just learning the trade there are various tools that you will need, but the router is up there on the list as it is one of the handiest and most versatile. You can use a router for various things from decorating edges and trimming laminates to cutting different woodworking joints. But this is only true if you have the right router bits for the tasks. There are dozens of router bits out there, and it is because of this reasons that you will always find a wall full of router bits in most fine woodworking workshops. Router bits will vary in various aspects such as their profile, tip types, shank sizes and much more. And so finding the best router bit set can be a little challenging. However, if you know the roles and application of the standard router bits, the different materials, and the top brands, you should have a less tedious time picking a set for your workshop. You can also read other product reviews such as wood router, router lift, router table. There are hundreds of router bits out there, but there are some essential ones that every woodworking workshop must have as they are ideal for most routing projects. While some of them will be ideal for a specific purpose, in many cases you have to use more than one to create complex shapes. Here are 12 of the essential router bits to have in the workshop. As the name implies, the edge beading router is for shaping the edges of pieces such as tabletops, chair arms, shelves and any other places that you need to enhance the edge. This router bit is similar to the round over bit to some extent because it will also apply a rounded shape to the edge of the workpiece. Edge beading bits can cut a quarter or half circle profile which is what woodworkers refer to as a bead. The Roman ogee bit is among the most popular edge shaping bits, and you will find it in almost all woodworking workshops as it is part of most wood router bit sets. This bit will create a compound, s-shaped profile and it comes in various variations. But the most common ogee bits are those with points in the middle of the profile or shoulders on the edges. And like most other edge bits they will come with a bearing tip. The glue joint router bit is a handy type of bit whose primary role is to create a joint in wood to make it possible to connect one piece to the other to form a larger panel. The most significant advantage of the glue joint bit over other joining systems such as dowels and biscuits is that it creates a large glue area for more adhesion. It is possible to cut a rabbet with a table saw when using a dado blade or even with a straight cutting bit. However, there is also rabbet router bit which is for this specific purpose. In definition, a rabbet is just a dado but on the edge of the workpiece. The rabbet router bit will ride along the edge of your stock, and in most instances, it will have a bearing tip. There are many router bit types out there, but some like the raised panel are for specific purposes. This router bit is for creating a profiled edge on the smaller door’s panel. These router bits will often be used with the stile bits to create door panels. Stile and rail bits will also come in handy when making frame assemblies. They are bit types that are used to make frames and the frame assemblies for use in small doors and cabinetry. And besides, from cutting the panel slot, these bits can also make some decorative profile into the workpiece. Among the different router bits that you can get the dovetail is among the most famous ones and also one of those that you are likely to use a lot. And it is meant to create tails for the dovetail joinery. However, you can also use a dovetail bit to make rabbets and tapered dadoes. This router bit will feature a flat bottom that has some angled sides which will be wider at the base. Round over bits are part of the edge forming router bit types. The bit is handy for complex design tasks, and they will in most cases be used for creating smooth, even curves to create a rounded edge of a particular radius on the workpiece. This bit has a ball bearing for controlling the width of the cut, and it will be useful for shaping the edges of bookshelves, tabletops and any other place where you would like to round over a sharp edge for decorative purposes. A flush trim is a must have if you tend to work with wood veneer or plastic laminate a lot. The flush trim bit is a straight-cutting bit whose main aim is to trim any overhanging material flush to the workpiece. It uses a ball-bearing pilot which is what makes it ideal for flush cutting and it will be a handy bit when making tabletops, cabinet, and drawer faces. The cove bits are in essence the opposite of the round over bit, and instead of just rounding over the edge of the stock it also cuts a concave radius on the same edge. The result that you get when using the cove bit is a decorative edge that will enhance the appearance of a cabinet door or furniture legs. A chamfer bit is a kind that you use to make a 45-degree cut on a square edge of a workpiece. These bits are very versatile, and they can create various chamfer size depending on the size of the cut. And like the beading bit, some chamfer router bits will also have a bearing tip that will ride along the edge of the workpiece. Straight carbide tipped bits are what makes your router one of the most versatile tools in the workshop. And they are also one of those that you will use most. These bits will be for cutting square bottomed straight grooves, and they will come in various diameters and lengths. But the most common and useful ones are 1/4, 1/2, and 3/4 diameter bits. The straight carbide tipped bit will be useful for cutting dadoes, rabbets, and grooves in plywood when making furniture. However, this is a non-piloted bit, and so you will need a router bit guide to get straight and precise cuts. Your choice of router bit set will determine the tasks that you can use your router to accomplish. While seasoned woodworkers will have dozens of router bits, buying that first router bit set is not always easy. But whether you are starting out or want to add a new set to your workshop’s router bit collection, there are some essential points to keep in mind to make sure that you make the right choice. Like with all other woodworking tools some companies stand out when it comes to the manufacture of router bit set. These companies have been in the business for long enough to know what woodworkers and hobbyists look for in a router bit set. And some of these reputable brands are Freud, MLCS, CMT and Whiteside. Freud Router Bit: Freud is famous for making some of the most technologically advanced blades. They also make their own unique micrograin titanium and cobalt combination. And this means that their wood router bits are among the best quality as they will always provide maximum cutting life. MLCS Router Bit: Any list of the best router bit brands for beginners is never complete without MLCS. Their top-quality carbide tipped bits are also relatively affordable when you compare them with what you get from other brands. CMT Router Bit: CMT is another brand that you can trust to make some high-quality router bit set. Although CMT might not be as famous as the other, their bits have a relatively long cut life, and in most cases, they are also a little pricey. Whiteside Router Bit: Many professional woodworkers will have a Whiteside router bit set as part of their collection. Their sets come with a variety of bits, and they are famous for leaving smooth surfaces on the workpiece that will require almost no sanding at all. Shank size is another vital point to keep in mind when trying to pick the best quality router bits. And in most cases, woodworkers will have to choose between the two standard measurements which are 1/4 and 1/2-inch. Many routers from different brands will come with interchangeable 1/4 and 1/2-inch collects to allow you to use either size of bit. However, some routers will only accept the 1/4-inch bit. But whenever possible you should always use bits with the 1/2-inch shanks. They are more stable than the 1/4-inch ones and with minimum vibrations, produce a smoother cut and also tend to have a longer cutting life. The materials matter a lot because it determines everything from the performance of the router bits to how long they maintain a sharp edge. And there are three different types that many brands will use to make their bits. Carbide Tip: Carbide is the material that you get on carbide tipped router bits. These bits hold a sharp edge for longer than other materials like high-speed steel and they will also cut harder woods and metals. Solid Carbide: The solid carbide router bits are by far the most robust and durable router bits in the market. They are ideal for heavy-duty tasks and when working on the hardest woods and other materials. High-Speed Steel: When you are looking for affordable router bits for use with softer materials high steel speed ones will be sufficient. These routers are ideal for recreational users, but they will not maintain their edge for as long as carbide tip and solid carbide bits. While there is nothing wrong with having a wall full of dozens of different router bits types, there are some types that you will rarely use. And this is in most cases because some router bits are very versatile and will perform the tasks that are meant for others. Hence these are the bits that you are likely to use a lot. The commonly used router bits include the straight cutting bits due to their versatility, round over bits, flush trim, cove bit and the dovetail. Freud is famous for its technologically advanced and high-quality bits and their 91-100 model is at the top of our router bit reviews. Despite this 1/2-inch shank bit set also being one of the priciest on our reviews, it is still one of the best router bits sets out there. Each of the 13 router bits on the set features TiCo (titanium and carbide) tip which is a high-quality material, tri-metal blazing and they also have an anti-kickback design. The computer-balanced bits offer vibration and chatter-free operation even when operating at high speeds. And each of the router bits come with a high shear angle to produce fewer tear outs and minimal chatter marks. This 13-piece set might not come with the most router bits but what you will love about it is that it comes with the most commonly used bits. Case quality is not the best. If you are a beginner woodworker that is searching for a cheap router bit set the MLCS 8377 will be an excellent choice. And what makes it stand out is that it will come with more pieces than most other sets in our reviews. It is the most affordable set in our reviews, but the bits are still high-quality and durable enough thanks to the carbide tip construction. These starter bits use 1/2-inch shanks, and so you will not have to worry about vibrations and tear outs when using them. Although they perform well, they will not last as long as the more expensive router bit set. And to make this an even more fantastic router bit set, it also comes with a classy and attractive wooden box for storing all the bits. This 13-piece router bit set by CMT is the priciest item our reviews. But it is worth every buck you spend on it as it comes with different router bits for a variety of applications and all feature a top-notch construction. These bits feature high-density chrome carbide cutting edges that ensures you always get a long-lasting performance as the bits maintain a sharp tip for a long time. Some of the bits have an anti-kickback design to provide safety and also make them more comfortable to use. Also, others have a bearing to make template task easy. Like the MLCS set, this one will also come with a unique and highly durable hardwood case to make it easy to store and organize your router bits. While it is always a good idea to have as many bits in the workshop as possible sometimes it is not necessary since many woodworkers always end up using just a few of them. What this means is that this 7-piece basic router bit set can still work just fine for you as it comes with all the commonly used bits. And besides from the set including the most useful router bits all are also sturdy and highly durable thanks to the premium carbide construction. The bits also feature a precision grinding design that provides excellent balance even at high speeds. And when you buy these 1/2-inch shank bits you will also get a small, durable case for convenient storage. A little pricey for a 7-piece router bit set. With a total of 24 pieces, this router bit set has the most pieces on our list but the most impressive element about it is that it is also one of the cheapest on our reviews. The kit comes with almost every bit that you can possibly need for your projects, and they are universal 1/4-inch shank bits that will fit all routers. Despite their affordable price tag, the bits are also relatively durable thanks to their carbide tips. And they will come in a sturdy wooden box that makes them easy to organize, store and transport. Just like the MLCS 8377, this router bit is a great choice for someone that is just starting out. Yonico makes their 17150 bit set for a starter that is looking for a 1/2-inch bit for use in the workshop to complete various routing tasks. It is a 15-piece set that comes with premium micro-grain carbide cutters that also have a silver induction brazing for maximum strength. The bits also have high-quality and fully-enclosed lubricated radial ball bearing that help to make them high-performing, reliable and long-lasting. The set also includes a lovely solid wood case to protect your valuable bits when not in use, and it will come with a limited lifetime warranty. It is hard to get a similar quality 15-piece router bit set that is cheaper than the Hiltex 10100. And so it is a great pick for any woodworkers looking for something that offers excellent value for money. Each of the router bits has precisely machined and sharp YG8 tungsten carbide blades that will always deliver clean and accurate cuts on any wood type. Also, the hardened solid steel alloy construction provides durability and longevity for the bits and they also have an enclosed bearing roller to provide smooth and aligned routing. This router bit set also comes with a wooden index case that will make them easy to store and organize to minimize the likelihood of losing any of the bits. The router is one of the handiest power tools you can have in the workshop as it makes it easy to shape and decorate your workpiece. But, to get the best service from it, you need to have the right router bit. There are dozens of router bits out there, and each has a purpose or a shape that it can create. And while it is essential to have as many as possible the wise idea is to focus more on getting the best quality router bits. 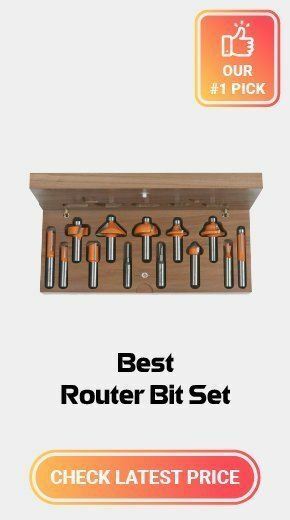 With our reviews of 5 of the best router bit sets out there and in-depth buying guide above you should have a good idea of what to buy.